Dorothy Gordon helps a customer at Ron's Market. Dorothy Gordon shows off one of her nine Michael Jackson tattoos. 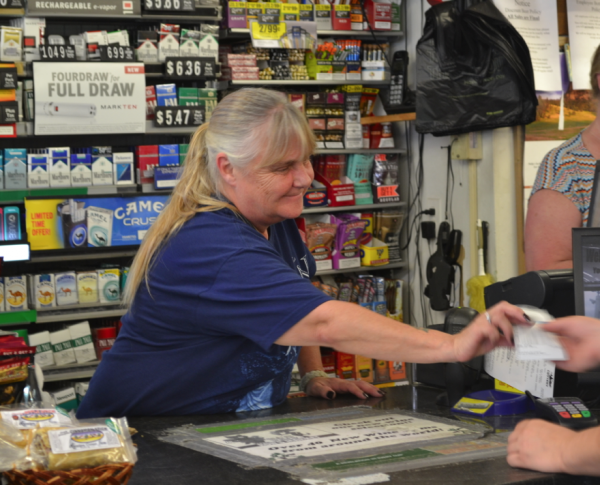 FARMINGTON - Anyone who has ever stopped in at Ron’s Market, whether it be for a growler of local beer or a 30-rack of PBR or just a slice of pizza, has probably been helped by Dot at one point or another. “I sort of came with the store when the owners bought it. I’ve worked here for 11 years,” Dorothy Gordon says. We’re sitting outside the store at an old fast food booth. 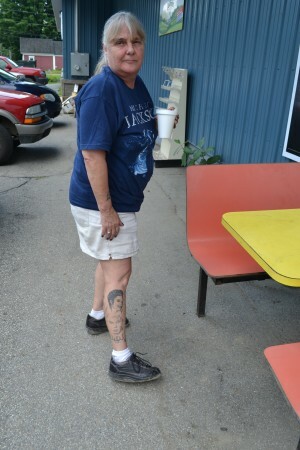 Dot is having a cup of coffee and a cigarette before her shift starts. She pauses occasionally throughout our conversation to talk with customers walking by, everything from the weather to how their kids are doing. Gordon put herself through the Motorcycle Mechanic Institute in Orlando and graduated with a degree specific to repairing Harley Davidsons. She was the only woman out of 375 men. After graduating she worked at the Orlando Harley Davidson Dealership for five years, where she ended up working on her future fiance’s bike. They came up to Maine for a two week vacation and he fell in love with it. A year later they packed up all of their belongings and moved back to Gordon’s hometown. Good to know you better, Dot. Thanks for sharing your story. You are what I call A REAL MAINE WOMAN! And thanks, Amber Kapiloff, for writing this new column. This is really a great idea for a column! Good idea for a column. I've seen her for years, always enjoyed our interactions, but never knew anything, really, about her. It's nice to finally meet you, Dot. She is a pretty great lady!! This is a great idea for a column. And I am glad to know a little bit about Dot now. She is very good at her job...efficient and patient. Great idea for a column. Interesting article, too! My daughter would call Dot "good peeps", and that she is!! !